Wembly Red Holiday Necktie Tie Christmas Tree & Ribbons. For the Bold! 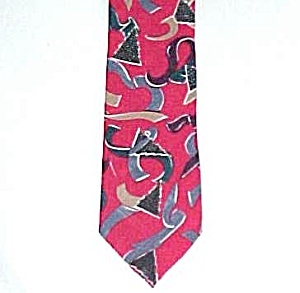 This SHARP 100% Polyester tie features a criss crossed Red background with swirls of ribbons and lots of Christmas Trees. The Ribbons are Tan - Gray - Dark Maroon - Dark Teal Green. The Evergreen Trees are bordered with White with White & Gray dots for Snow or Ornaments and topped with a Yellow Star. Measures 4 inches at widest x 57 inches long. Tag is marked SPL 4075 - Made in U.S.A. - From imported fabric fiber - 100% Polyester. Pre-owned - Does not appear to have been tied - looks clean and nice. A very Smart Designer Tie! A wonderful gift for the fellow who likes to be dressed for Holiday Parties!